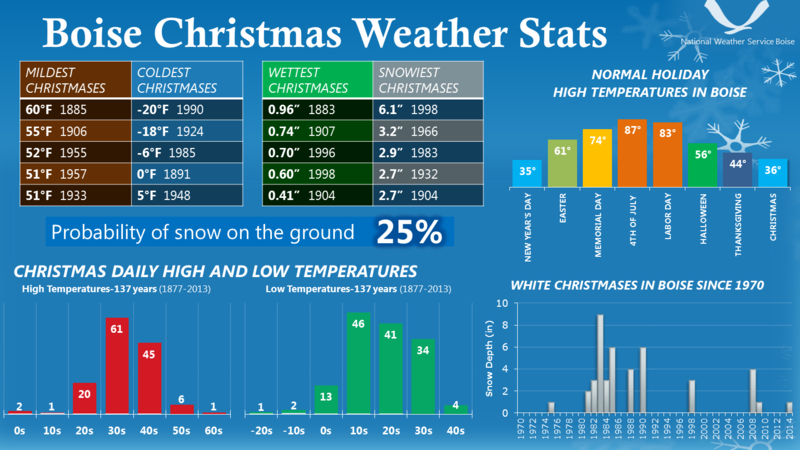 For Christmas statistics at other selected cities across southwest Idaho and southeast Oregon: Click Here . 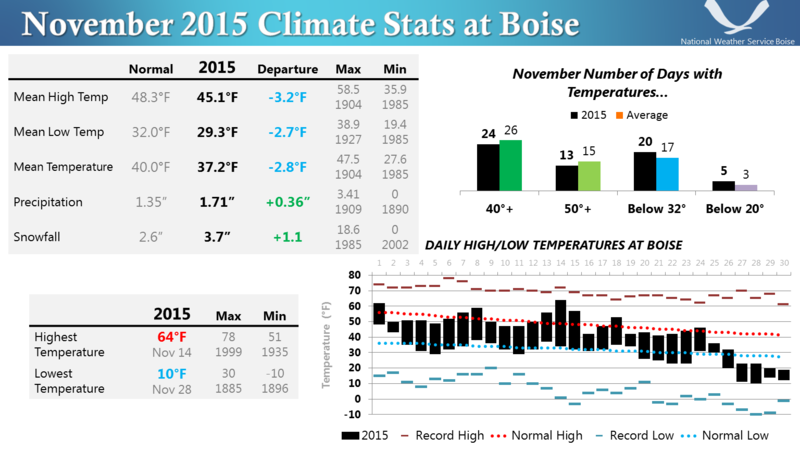 During the first three-and-a-half weeks of November, Boise experienced typical late fall weather with both temperature and precipitation averaging near normal. But the month ended with a trial run of winter which lowered the average temperature to below normal. This was the first colder-than-normal month since November 2014. Prior to the cold snap changeable weather typical of late fall brought mostly clear skies and mild temperatures alternating with cool showery weather. A series of low pressure troughs impacted the Western United States on the 3rd, 10th, and 15th. Much of their energy headed south into southern California and Arizona, limiting precipitation amounts at Boise. On the 15th, the first measurable snow of the season (just under ½”) fell at the airport. On the 18th, a weather system from Alaska arrived over Montana, initiating a pattern change to northwest flow over the Pacific Northwest. This brought only minor cooling, but it set the stage for November’s main event, which started life as a weak trough over the Aleutians Islands in Alaska. On the 21st, the trough deepened as it crossed the Gulf of Alaska and arrived over the British Columbia coast on the 23rd. It drifted south and further intensified off the Washington coast, picking up additional moisture from the abnormally warm water before swinging inland over southwest Oregon and northern California on the 24th. As the storm settled over Nevada and Utah, precipitation began as rain at Boise on the evening of the 24th, then changed to snow in the pre-dawn hours of the 25th. By the end of the day, two inches had accumulated at the airport. Snowfall tapered off toward the west, with only traces on the ground in parts of west Boise. The storm provided more than half of November’s precipitation, and the 0.67” on the 25th set a new record for the date, eclipsing the 0.32” set in 1956. As the snow ended, modified arctic air filtered into the valley from high pressure centers in British Columbia and western Montana. From the 26th through the 30th daily temperatures averaged between 10 and 20 degrees below normal. But the cold air was shallow, and warming aloft soon created a temperature inversion. Although the storm at Boise had ended, enough moisture remained to form a stratus deck at the base of the inversion, between 1,000 and 2,000 feet above the surface. The low clouds prevented overnight temperatures from dipping as low as they might have under clear skies.